13 –Josh Wink & Lil' Louis How's Your Evening So Far? Live mixing by Ken Ishii at "REEL UP" Liquidroom, Tokyo, December 22nd 2000. Comes in a clear jewel case with obi-strip. Enhanced content includes "Reel Up movie files". 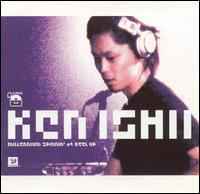 ℗&© 2001 Sony Music Entertainment (Japan) Inc.
One of the finest DJs in the world, Ken Ishii bested his previous mixing masterpiece (X-Mix: Fast Forward & Rewind) with Millennium Spinnin' at Reel Up. Beginning with his remix of his own "Iceblink," a blinding piece of tribal-house into turntablism, Ishii rolls through 20 perfectly paced tracks. Highlights include a remix of "Firecracker" by Japanese favorites Yellow Magic Orchestra, Dave Clarke's "Before I Was So Rudely Interrupted," and an intense middle section composed of tracks from minimalist masters Jeff Mills, Joey Beltram, and Luke Slater. This CD also contains video clips of Ken Ishii DJing at this session (which is in the Liquid Room) and record covers for all the music used.